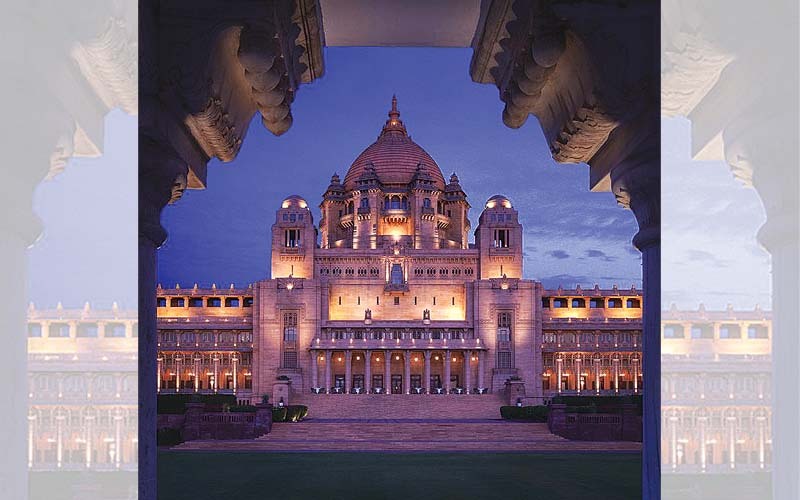 The Umaid Bhawan Palace operated by Taj Hotels, Resorts and Palaces is one of the world’s largest private residences, located in Jodhpur, Rajasthan. Built by Maharaja Umaid Singh in 1929, the palace was an outcome of Keynesian policy, which provided employment to thousands of people during a time of famine. Sitting on the city’s highest point, Chittar Hill, the palace stretches across 26 acres, and includes over 15 acres of formal gardens that make this hotel historically astonishing. This art deco wonder boasts its own museum, which showcases stuffed leopards and the royal family’s impressive classic car collection. A journey through these magnificent 347 rooms includes a walkthrough the palace’s dining halls, library, ballroom, swimming pool, billiards room, tennis court, elegant foyers and halls, and marble squash courts. Pink sandstone and marble run throughout the grand lounge area, and the entrance is covered in dramatic black granite. The architecture of the palace was inspired by Mughal architecture and Hindu temples, blended with Beaux Arts-influenced domes and columns. It also has other features such as Buddhist edifices from the temple and mountain palaces of Burma and Cambodia. One of the most prominent parts of the palace is the Maharani Suite, where the wardrobes and cupboards are made of curved lacquered wood, and the furniture is colourful and streamlined. 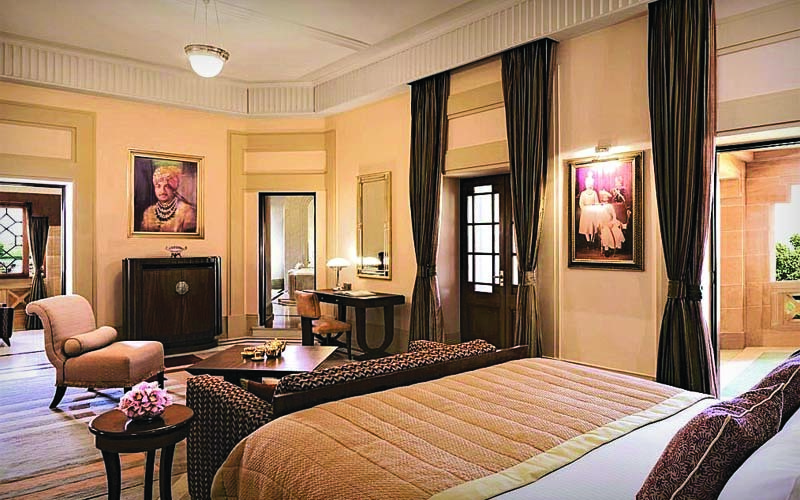 Sprawled over 4,850 square feet, the suite’s private terrace overlooks the Mehrangarh Fort and the palace lawns. The suite also has a stunning mural of the goddess Kali.